It has been an exceptional year for South African pop group Mafikizolo – Theo Kgosinkwe and Nhlanhla Nciza, picking up numerous awards and scoring lucrative endorsement deals. Nhlanhla is the cover star of True Love Magazine South Africa’s August 2014 issue. Rocking her famous hairstyle, she is seen in a multi-coloured print dress, silver earrings and a statement bracelet. 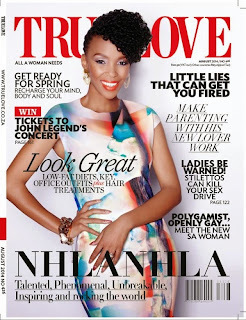 The “talented, phenomenal, unbreakable, inspiring” Nhlanhla dishes with the publication of life according to her.